Why not give your feet something stunning to stand on? When you come to our flooring store, we help you add real appeal to your living area. Choose from a wide variety of luxury vinyl tile flooring in all price ranges. Our new flooring products give homeowners and business owners practically limitless options when they want to give their floors a stylish makeover. Most importantly, luxury vinyl tile (LVT) is very affordable and easy to install. Take advantage of 3D printing technology when you select our quality LVT as your flooring option. This type of flooring mimics wood, stone, ceramic, and other materials. Using natural colors and even textures, they will fool even your family and the most observant guests. Allow our flooring experts to help you choose the perfect flooring for your home or business. Improve the appearance of your living area by depending on our professional LVT installation team. Simply choose the pattern, color, and style, and our flooring specialists will install it efficiently and affordably. We have performed flooring installation for many years. For exceptional results from start to finish, you can rely on us. Any new floor needs a sturdy and level surface. 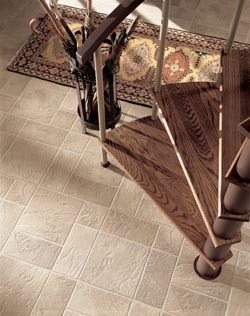 In order to ensure long-lasting and quality luxury vinyl tile flooring, it’s important to accurately prep the surface. That’s why we take care to do everything right. We make sure the floor is smooth, clean, and level before installation. The installation is faster and easier than hardwood and tile flooring. At the same time, it costs less and is easier to maintain. Affordability doesn’t always mean versatility. However, when you come to us for affordable LVT, you’ll enjoy discount flooring that caters to your style preferences as well. Since luxury vinyl tile simulates hardwood and other materials, it comes in so many unique colors and textures. Even customers on a budget can afford quality LVT. Don’t settle for run-of-the-mill floors bought at a big-box store. We offer only the best products at the most affordable prices. Save money, enjoy quality LVT, and help the environment. Luxury vinyl tile flooring has another advantage over traditional floors. It is eco-friendly! The manufacturing process of traditional vinyl tile does not save our non-renewable resources. In addition, some kinds of older vinyl tile actually contain a hazardous material, asbestos. However, today’s luxury vinyl avoids these issues. Due to advancements in technology and the manufacturing process, LVT is produced in a way that has minimal environmental impact. Manufacturers of LVT use less non-renewable resources, and they recycle many vinyl products. For an affordable, attractive, and eco-friendly flooring product, the obvious choice is luxury vinyl tile. Contact us to improve the appeal and value of your property by installing LVT. We proudly serve the communities of Kalamazoo, Portage, Mattawan, Schoolcraft, and Plainwell, Michigan, plus the surrounding areas.